Clutch switch circuit inspection is necessary for manual transmission vehicles. When the clutch pedal is released, the ECM receives the positive (+) battery voltage through the ECU-IG NO. 2 fuse and ignition switch. While the clutch pedal is depressed, the clutch switch assembly sends a signal to terminal D of the ECM. The ECM cancels cruise control when terminal D receives the signal (voltage of below 1 V). (a) Remove the clutch switch assembly (See page ). (c) Reinstall the clutch switch. 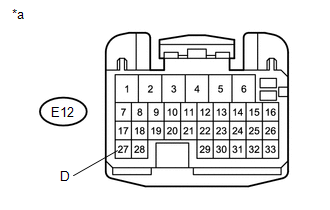 (a) Disconnect the E12 ECM connector. 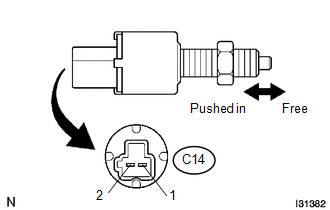 (b) Disconnect the C14 clutch switch assembly connector. (d) Reconnect the clutch switch connector.